Invisa Hotel Es Pla is a hotel located in San Antonio, Ibiza, specially designed for people over the age of 18, either to stay as a couple or with a group of friends. It is a hotel designed only for adults, where you can enjoy all the tranquility that we occasionally miss due to the joy and energy of children. Disconnect from your everyday routine in our two swimming pools, one with music and entertainment, and the other with chill-out atmosphere, and experience an unforgettable holiday. The 3-star hotel is located in a place that offers the possibility to relax by the Mediterranean Sea, enjoy amazing sunsets, swim in crystal clear waters, go to nightlife areas... Ultimately, in San Antonio you can do (almost) everything you can imagine. 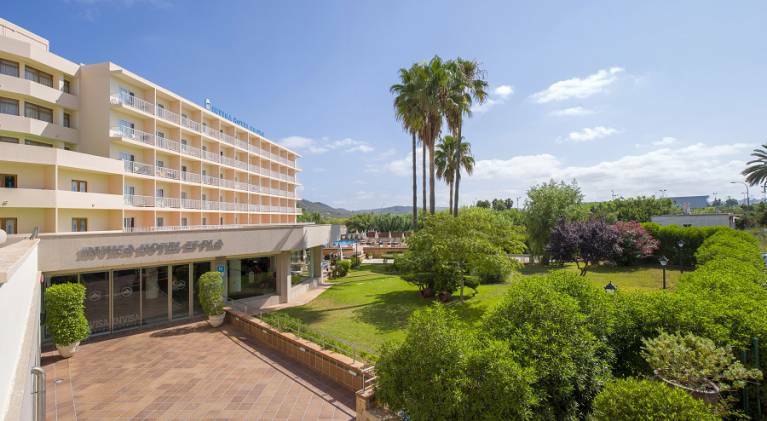 The Invisa Hotel Es Pla is accessible, and includes accessible rooms, all of which are on the ground floor. The rooms features a roll-in shower, shower seat, and grab rails. The beach nearest the hotel can also be accessed with a wheelchair.